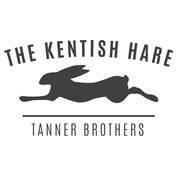 The Kentish Hare is overseen by the Tanner Brothers. Chris and James have assembled a great team focussing on delivering the very best fresh local food. The pub takes full advantage of the superb larder available to us in Kent, complemented by a specially selected range of superb wines, beers and spirits. The Kentish Hare is a family friendly pub with great food and service where children under five eat free. Chris and James and the whole team look forward to welcoming you soon. I came for lunch on Easter Saturday and it did not disappoint. The Rump of Lamb with sweetbread was delicious, perfectly cooked and melt in the mouth. For dessert I had the Chocolate Ganache with ice cream which was amazing. The Merlot was sublime lovely and smooth. I have eaten at your restaurant many times and it always has good service and atmosphere and of course amazing food! Lovely welcome from the staff and very tolerant of a large group where decision making takes time. We had a excellent meal. The young lady that served us was very knowledgeable about the food and drinks. I frequently visit. Excellent food. Maybe a bit pricey. But it is not a traditional pub and hence this is expected. Friendly team. Booking online is easy. Another really enjoyable night and once again the staff were brilliant. Excellent meal. And not noisy, so conversation was easy! Our group had such a brilliant time, enjoying a delicious Sunday lunch, chosen from a wide selection of dishes. Service was amazing, the venue and atmosphere very relaxing. Thank you to all the staff for making this a very enjoyable experience. A fantastic evening. The Tanner brothers were brilliant hosts. All the staff from the bar to the waiting staff to the chefs - second to none! Thank you so much. Angelica Bell was the icing on the cake! The food was perfection. Wine pairings spot on Paul - thanks! Enjoyed every second ... will be keeping an eye open for the next taster evening! We visited The Kentish Hare after our marriage ceremony in the morning and it could not have been more perfect. We went for an early lunch on a weekday so it was quiet but somehow still atmospheric, maybe because of how brilliant and welcoming the staff were. The food was delicious, there were six of us and we had three courses each and had no complaints about any of them which is rare. They also have a great wine selection with local choices and we even met the owners who were also really friendly. I can't thank everyone enough, it was such a lovely day. It’s been a few months since withlast visited the Hare and we were pleased to see some changes to the menu. Super dinner, very relaxed, service not quite on the money on this particular occasion. Saturday dinner with my parents for a belated birthday celebration. Attentive service and the food was great. Loved the garlic risotto! Anther top quality meal excellent local ingredients. If you go to the Kentish Hare its very simple really, good food perfectly cooked. Having moved to within walking distance I am very pleased to have the KH right on my doorstop. Great steak and the chocolate fondant tart was delicious. Only downside was not seeing the dessert menu at the beginning. I like to plan my meal around dessert! The food was incredible. Ordered the short rib which was divine, I got a bit emotional actually whilst eating it and almost cried...will definitely be coming back! Very nice lunch; thank you for being wheelchair friendly. The menu was very original, wine list great and our waitress was fantastic. We can't wait to come back! We had a fabulous lunch for my daughter Louises Birthday on Wednesday 3rd April....rounded of with a brilliant chat with James Tanner. This was our second visit and we will definitely be back. Once again thanks for a lovely lunch also should mention the waiting staff ...also so happy and efficient. Superb restaurant with excellent food and service. Very accommodating and happy to vary the menu to suit individual requests. One of my favourites places to eat in Kent.